"I told you I shed a lot. Don't start complaining now!" Get a black pug. The great advantage of the black pug is that he has only one coat of hair. The fawn pug has a double coat. Therefore, he doesn't shed as much. 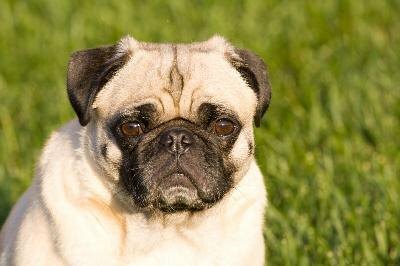 The fawn pug's undercoat is constantly growing and pushing the hairs on the upper coat out, hence the constant shedding. Unlike some breeds, the pug doesn't shed seasonally. He sheds constantly. The fact that he prefers an indoor life means the shedding will become pretty noticeable in the house. Grooming and bathing are two ways you can minimize shedding regardless of what color your pug is. Brush your pug every day. This removes hairs that he is about to shed before they end up on your furniture and clothes. In addition to brushing, use a de-shedding tool, like a nit comb for kids, which has fine teeth to remove more hairs. Ideally, from the point of view of reducing the amount of vacuuming you need to do, groom him in an outdoor space if you have one. This is easier for people living in warmer areas of the country. If you don't have the option of an outdoor space, or it's too cold, stand him on a grooming mat on a table, or at least on an easily cleaned floor where you can collect the hair easily afterward. Grooming him on carpet gives you a more difficult cleanup job afterward. Bathe your pug frequently, at least once a month. Pugs are among few breeds that like having a bath; if you make it an entertaining time, you won't hear many complaints from him. You can bathe a pug up to once a week as long as you use a mild, hypoallergenic shampoo that doesn't irritate his skin or dry out his coat, as pugs are highly susceptible to dermatitis-type conditions. Pay careful attention to his eyes and ears during bath time, and make sure you don't get shampoo or water in either. Your pug's large eyes develop irritations rather easily, as do his ears. Dry him off well. It takes ages for a fawn pug's coat to dry naturally because of its double layer. You may need to dry him off with a blow-dryer on low heat if you can't put him out in the sunshine for a snooze while he dries off. Dietary supplements are thought to reduce shedding. Some vets recommend vitamin A and fatty acids. Adding a tablespoon of flaxseed or olive oil to his food is one way of doing this. However, talk to your vet about supplements before giving them to your pug. Finally, help your pug get a lot of outdoor exercise, as this keeps his coat healthy and as a result slows down shedding. What Do You Do for a Little Dog That Sheds A Lot?